It is said that every next level of your life will demand a new in you and if it comes natural or by virtue of scars on your body, you start looking differently which adds in recognition of your character. One should be proud of scars as there are some natural scars on your visible body and some reminds you that you had been hurt and healed. When a bowl is broken in Japan, it’s put back together with the cracks being filled with gold creating a beautifully lining. In fact, this is to emphasize to beautify in what was broken. To beautify the presentation of the character in the movies, usually the scares are used to show that a character is bad to the bone. 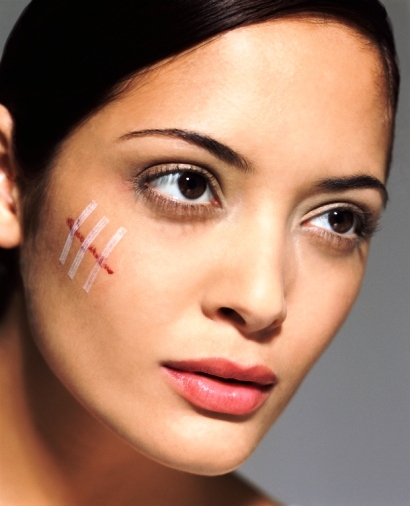 But rationally, we know that people with scars in the real world are just unsuccessful victims of shock or surgery. At the same time, scars have the strange power to remind us that our past was real and sufficient proof that there is possibility of healing. Certain film actors – Raj Kumar, Nana Patekar despite having heavy scars on their faces were not rejected by the audience as they had peculiar voice also. We cannot be perfect throughout in our life. Something will go on changing with the circumstances and scars by virtue of accidently or developed naturally, make addition to your character. Looking different is the human nature and I know a friend of mine, who had a black scar below the left shoulder but was not visible and to look different by showing the scar, he used to ask his tailor to put the first button little below so that the scar is visible. We can learn a lot , if we correlate the scar later on healed with our life like change is the law of nature and whatever may be reason behind the cause of the scar which has added to your beauty or disfigured but thankful that we are surviving. Anything major could have happened. You look beautifully all the time is not possible in the aging process also. In fact, there is no need to show you where people know you and at the same time, there is also no need to show where people even don’t know you. We see when bad things happen, we don’t instinctively feel happy and beautiful but that does not mean we should feel despair because life gets ugly due to scars. These are all temporary factors. Both you and others around you will be used to your new and different look. Such incidents are part of life but definitely inspirational for others that we should not be worry about ‘what we were but what we are’.